This week's giveaway is from Sonya of Good Egg Girls. Sonya is giving away this fun choker. Good Egg Girls give their chokers women's names and those names and their meanings serve as inspiration for their accessories. This choker is called Cora and Cora means Serious! Sonya found new life for a necktie in this unique choker. Sonya describes the design as "a statement piece" and the "perfect marriage of masculinity and femininity of 21st century." The choker is made from a vintage tie, which is 100% silk by Liemandts. The tie is adorned with a hand-sewn, gold-plated hanger and chain. The choker has a silver, medium-sized snap for ease of closure and to change direction. It can be worn with a variety of outfits from dressy to casual. The choker fits a neck size up to 16.5 inches. The width is 1.5 inches and the chain on the hanger adds another 1.75 inches. Wear it and know that there’s not another one like it! Open to US and interntaional residents. 7. Follow Good Egg Girls on Twitter. Comment back here with your Twitter link. Existing followers just leave your Twitter link here. Contest ends Saturday, November 12, at 12:00 noon Central. One winner will be chosen by Random.org. 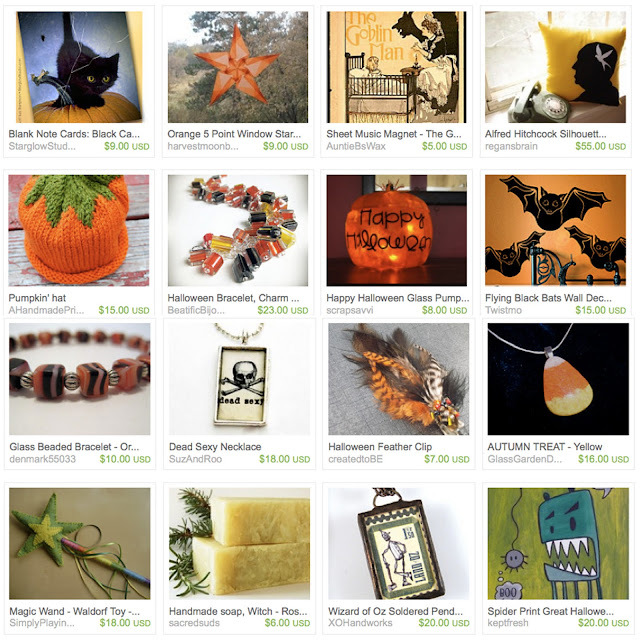 It's getting darker earlier—must be Halloween time! This week's giveaway is from Kristin of Fashionably Chic. Kristin is giving away this lovely Simple Chic Silver Heart Locket. Lockets never go out of style. It might be because the wearer can add a personal touch by including a cherished photo or small momento. This charming metal heart locket is attached to a sterling silver chain. The chain is 24" inches long and does not include a clasp. The dimensions of the locket closed are a little over 1 inch high by 1 inch wide. Open, it extends to about 2.25 inches. 6. Follow Fashionably Chic on Twitter. Comment back here with your Twitter link. Existing followers just leave your Twitter link here. 8. Become a Facebook Fan of Fashionably Chic. Comment back here with your Facebook name. Existing fans just leave your Facebook name here. Contest ends Saturday, November 5, at 12:00 noon Central. One winner will be chosen by Random.org. October is Kitchen and Bath month. Check out these Fun Friday Finds to spruce up your kitchen and bath! 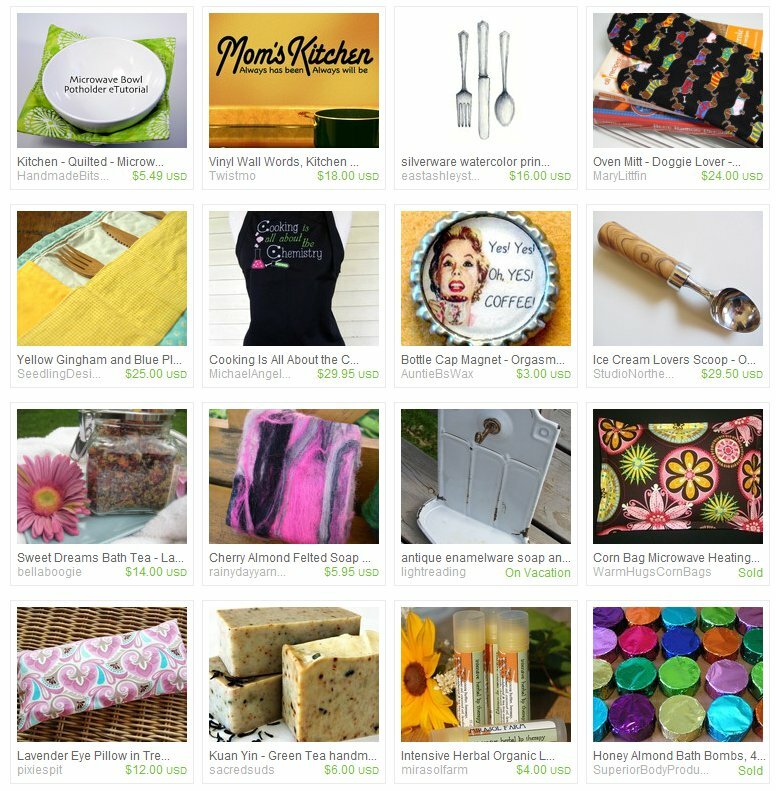 Yes, there is still more handmade product that has been donated by our team members for the Giveaway Baskets and Swag Bags for our HandmadeMN Fall Market! Our team members are awesome and very generous. One lucky person will be receiving these soy crayons from Melissa of EarthGrownCrayons! Yes, everyone! Winter is coming to Minnesota - it's an annual ritual that is once again upon us. And what better way to keep warm during these upcoming colder months than with a hat from Jodi of Pinswithfury! Need to relax at the end of a busy day? Try these lavender-filled eye compresses from Dawn of ShantiDesigns to chase away the stress and anxiety of the day. Scissorsavvy creates these delightful notepads from recycled books and bingo cards! Many of you will find these in your baskets and bags! Larissa from LefthandOriginals describes her art as where "vintage meets modern." Look at this beautiful necklace that Larissa has donated - beautiful! See you at the HandmadeMN Fall Market! WHERE: James Ballentine VFW, 2916 Lyndale Avenue S, Minneapolis, MN 55408. Parking lot located at rear entrance to VFW, on Aldrich Avenue. Our HandmadeMN Fall Market is only 6 days away now! The team is getting excited. We're working on the last of our product for the show. We checking our displays. We're reminding our family and friends about the market. We're getting excited - ooops, I think I already said that! 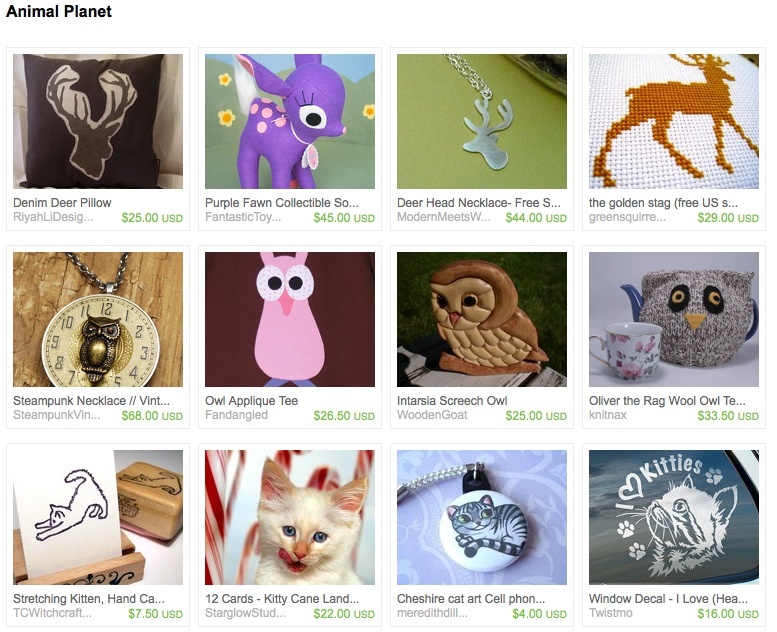 And here are a few more handmade items that you could find in one of our 2 Giveaway Baskets and 25 Swag Bags! Kim of BaronessColor has donated this beautiful scarf for one of our giveaway baskets! These sleevies or fingerless gloves are the perfect thing for our upcoming winter season! Thank you Margaret Mousley for your donation! Mary of MaryLiffin has donated these cute and adorable napkins! And who wouldn't like to win one of these beautiful hand painted silk scarves from Jodee of PalettePassion. Brenda of LightReading has donated these awesome bookmarks for our swag bags! And we have a pair of earrings from Mara of DragonflyAdornments that some lucky shopper will receive in their swag bag! This week's giveaway is from Valerie of Miss B Accessories. Valerie is giving away this fun ponytail holder. This is a sophisticated, yet whimsical korker ponytail that is the perfect addition to any wardrobe! 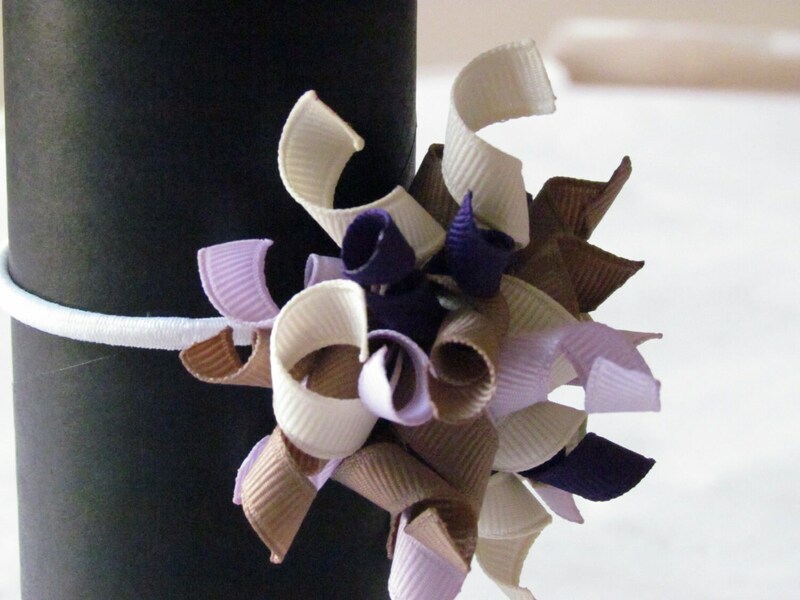 Deep purple, with light brown, ivory, and lavender make a stunning color combination. The ribbons are cut short, so they hold their shape and zany-ness. The bow measures approximately 3" in diameter, and is hand-sewn onto a white metal-free pony O. 6. Follow Miss B Accessories Twitter. Comment back here with your Twitter link. Existing followers just leave your Twitter link here. 8. Become a Facebook Fan of Miss B Accessories. Comment back here with your Facebook name. Existing fans just leave your Facebook name here. 9. Follow Valerie's blog. Leave a comment here letting us know you are a follower. If you are already a follower, leave a comment anyway, as each comment is an entry. Contest ends Saturday, October 29, at 12:00 noon Central. One winner will be chosen by Random.org. The leaves have fallen, and Halloween is right around the corner. Time to play outside while you still can! HandmadeMN certianly has a fondness for animals! Thanks to Erica of keptfresh who curated this fun collection of fur, feathers, and other fantastic animals! The treasury and clickable links to all of these whimsical creations can be found here. Our HandmadeMN Fall Market is less than 2 weeks away! All of our shoppers will have the opportunity to win a Giveaway Basket full of product donations from our team members. And the first 25 shoppers will receive a swag bag with product too - remember there is both a front and a back door to the VFW. This is but one of the beautiful fused glass necklaces that Toni of WildDogStudio donated! And look at this necklace that Suz of SuzandRoo made for us. You will find these in many of our swag bags! Renae of Trigo sent us business card holders and her trademark monster coin purses! I don't know about you, but I want one of these cute monsters!! Do you have a little girl or granddaughter? Wouldn't she look cute in this pink tutu from The Hobby Room? Thanks Andrea! 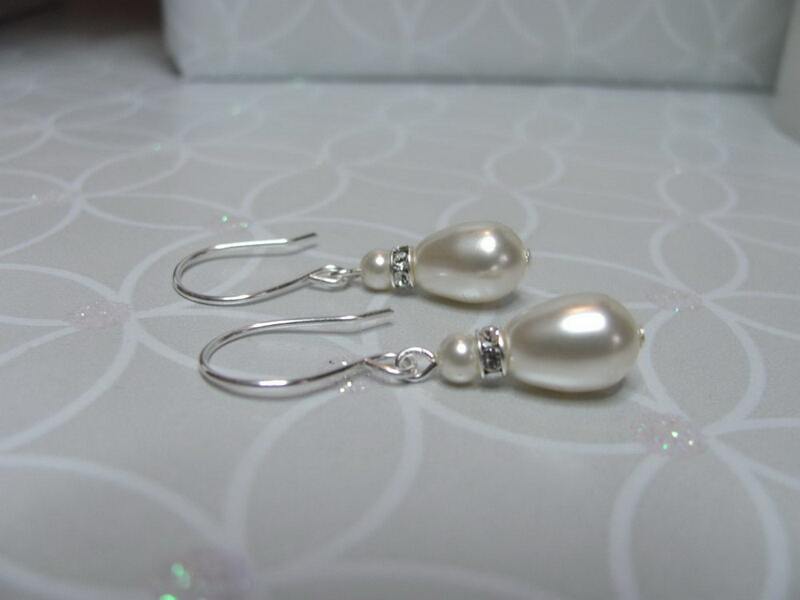 This week Dawn of dmalia is giving away these lovely Swarovski pearl and crystal rondelle earrings. Swarovski ivory pearl drop with crystal rondelle. A classic pearl drop with a modern twist of a crystal Swarovski round topped off with a small ivory pearl. Handmade sterling silver earwires. Visit Dawn's shop, pick your favorite item and leave a comment on this post about it. Please make sure we have a way to contact you! For Bonus Entries: Please leave each in a separate comment, as each comment is an entry (To qualify for extra entries you must do step one above). Contest ends Saturday, October 22nd, at 12:00 noon Central. One winner will be chosen by Random.org. Good luck! October evenings in Minnesota are for getting cozy with a cat on your lap and a book in your hands, whether that's a book to read or a journal to sketch or write in, or your current scrapbooking project. And, okay, some people could skip the cat part, but they're missing out. Today we are getting to know Maggie Schultz from Bodice Goddess who lives in Saint Paul (you can also find out about her work at bymaggie.com). What do you make and why? I make a lot of different things, but primarily it's costumes, clothing, and crochet. I costumed in high school, and that's when I realized that dressing up is FUN! So when I have the chance, I create costumes. I then realized that I could take everything I was learning from costuming and try making my own clothes. I spent all of 2010 not buying anything new, and instead only bought second hand items and altered clothing to fit or made something new. I've gotten really drawn to crochet lately as well - there's something very zen about the patterns you can create with yarn. Also, crochet is portable, and I can work patterns with my mom and sister. 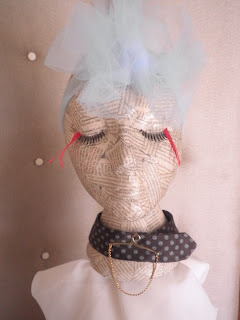 I've also been trying my hand at making other things, too, like hair fascinators and garters. I made a pair of garters for my sister's wedding last summer - that was fun. It depends on the project. I can crochet pretty much anywhere. In fact, I worked my first team challenge for HandmadeMN next to a bonfire. Sewing, though, is trickier. Currently, I have a studio corner carved out of the "dining room" area of my apartment. There wasn't enough space for a dining room table, but there's plenty room for my airlift table once I took the extra 3-foot wing off of it. I like having my sewing stuff in a common room so I have access to a TV and a couch - that way, if I take a break, it's still there, guilting me into coming back to work. I'm moving to a new place in September, and it'll be interesting to see how I work that space to suit what I need. What is your favorite part of the process? That's a complicated question. My favorite part of the process is seeing it DONE, and liking it. After that, there's a disconnect usually. Like the project isn't mine anymore, and it's off to live a life all its own. I feel a little bit like an eagle's nest. The babies leave and go off on their own, and I'm still here, getting stronger every year with every brood. I've got a little bit of (self-diagnosed) ADD, so I have to have something else going on practically at all times that I can ignore in order to focus. (For example, [at the time of writing], I've got the audio for an episode of "Boy Meets World" playing. :D) When I'm working on a project, I am a sucker for marathons. I crocheted a blanket for my boss's firstborn to a "Pirates of the Caribbean" marathon, and made a Joker suit to my "How I Met Your Mother" DVDs. OnDemand is my friend for that, too. Tell us something else that we don't know about you. I'd rather make a custom item for someone than anything else in the world. I like nothing more than taking a little kernel of an idea from someone, running with it, and bringing it back, completed and perfect. I've made corsets, messenger bags, and crocheted items with this in mind. My current favorite is the Fiery from Labyrinth that I made for a coworker's baby shower because we used to sing "Dance Magic Dance" to each other at the office (and because I had orange and red fun yarn on hand). The Fieries are the guys that sing the only non-Bowie song in the entire film, and take off their heads and throw them at each other. I thought it was an adorable idea for a matched toy-and-blankie set for the little ovenbun, so I got to work. I didn't use a pattern at all for the Fiery, and made him up as I worked. His head is detachable using strings of yarn to stay CPSIA-friendly. The blankie is based on a pattern from an afghan book and worked incredibly quickly. Here's the blog post I wrote about him. Of course, I'm not exempt from the "wanting a custom item" bug. In May, I made a red carpet gown for a movie premiere. The whole story's here. 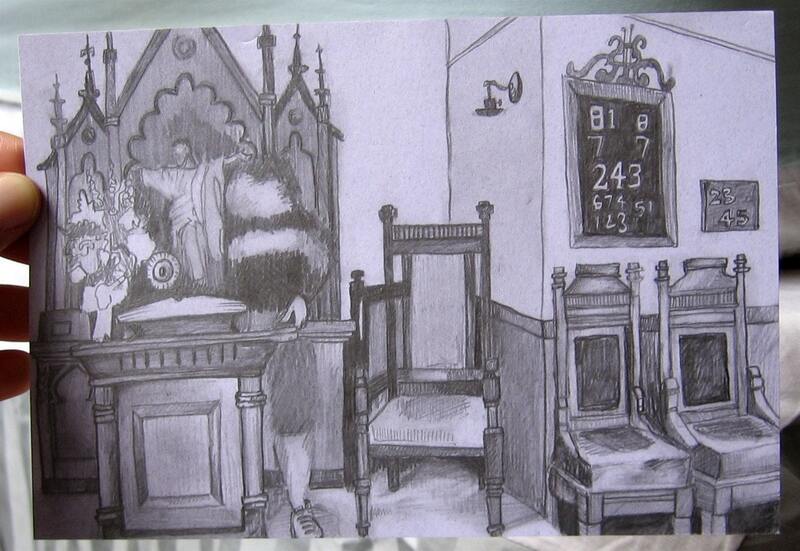 And Laura not only draws, she paints too. I especially liked this one. 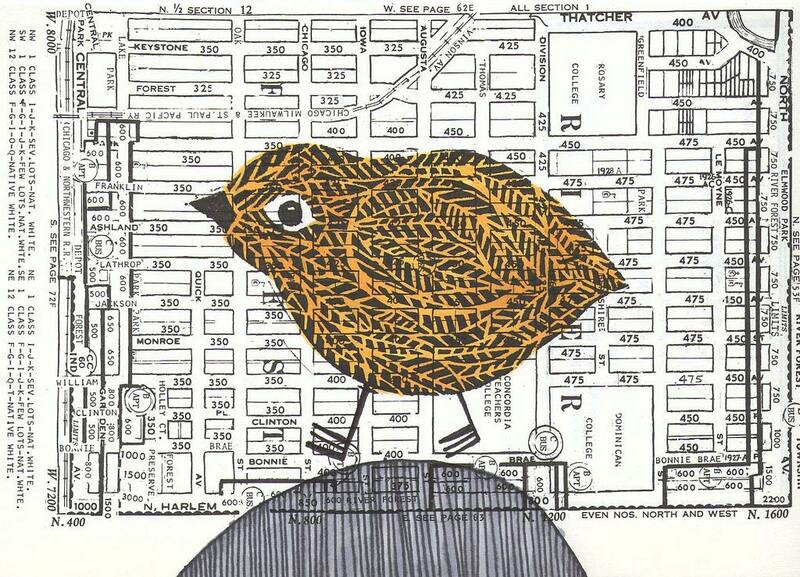 I'm completely enamored with the linocut prints Laura makes, especially the birds on old maps. There's just something really endearing about these pieces. 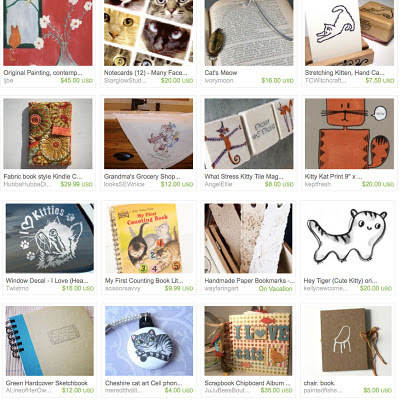 Also found in Laura's shop are journals, collages, and cards. If you can't pick up an ink pen or pencil and draw things yourself, I suggest going to Laura's shop and picking up a little something there. Fun, beautiful, and sometimes a little off-center ~ what more could you ask for from an artist? This week's giveaway is from Toni of Wild Dog Studio. Toni is giving away this adorable fused glass pendant. 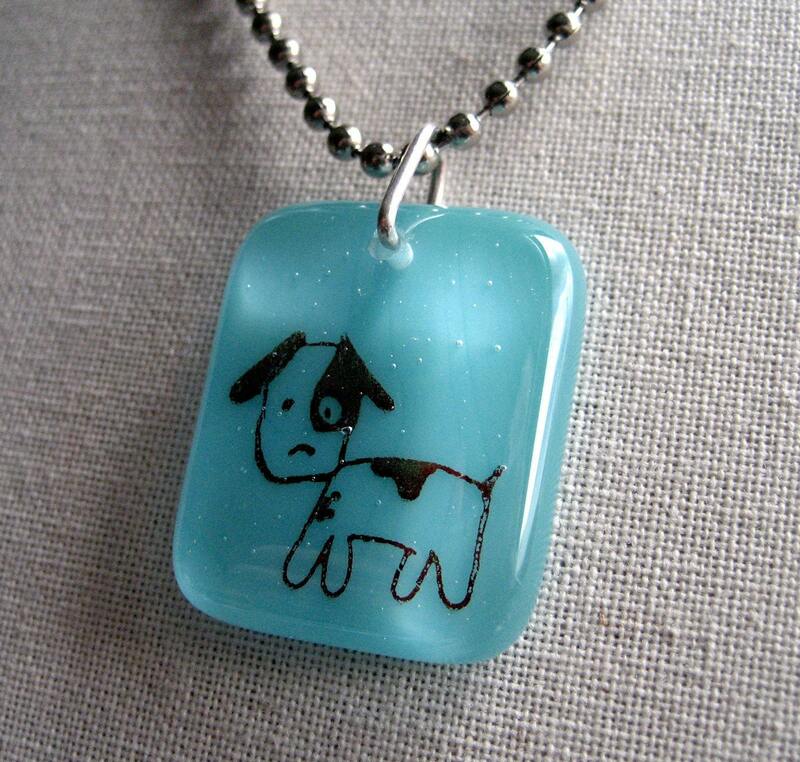 This adorable little puppy was hand drawn by Toni, then scanned and used as a decal in this wonderful little fused glass pendant. The pup sits atop a light blue base, and is topped with clear glass. She’s drilled a hole and added a simple hand formed sterling wire bail from which to hang him. He will bring a little fun to your day! 6. Follow Toni on Twitter. Comment back here with your Twitter link. Existing followers just leave your Twitter link here. 8. 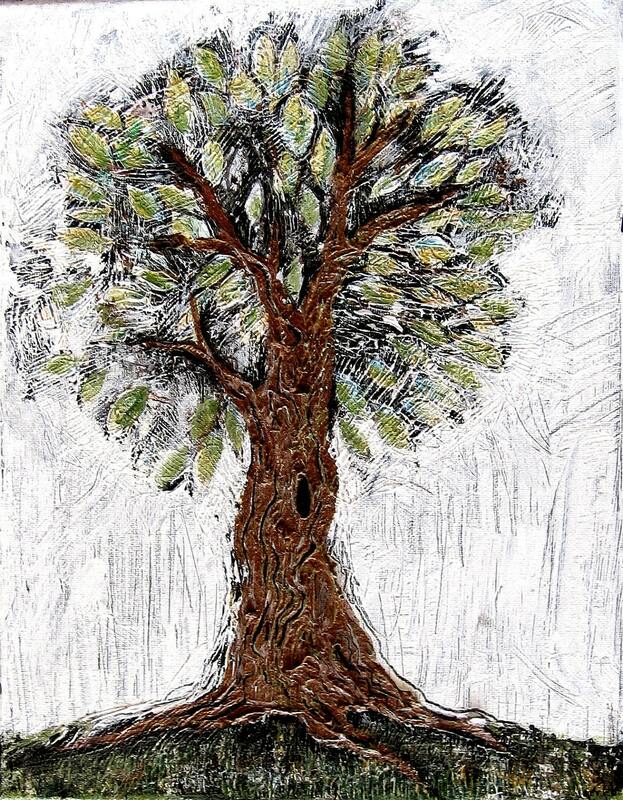 Become a Facebook Fan of Wild Dog Studio. Comment back here with your Facebook name. Existing fans just leave your Facebook name here. 9. Follow Toni's blog. Leave a comment here letting us know you are a follower. If you are already a follower, leave a comment anyway, as each comment is an entry. Contest ends Saturday, October 15, at 12:00 noon Central. One winner will be chosen by Random.org. This month's challenge theme is Halloween. Voting has Ended for Our October Challenge.